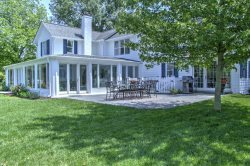 Beautiful property, very laid back and it was nice to just enjoy the Chesapeake and what it has to offer! The WiFi would not connect. There are several boards on the pier that need to be fixed. Staff is always friendly and willing to answer and questions or solve any problems. Very easy to work with. Lovely Cove farm is a beautiful home with a spectacular view. There were 8 in our family vacation, and the home easily met our needs. The men enjoyed fishing from the dock, we all loved the pool. We made s'mores from the fire pit in the evening. We saw bald eagles, Ospreys, herons, cranes flying over the water. The fresh vegetables from the garden were such an added bonus, and having the gardener Bill deliver them to the front door was so thoughtful. We did find the beds to be hard and uncomfortable, but that is always a personal choice. A chest of drawers in the twin bedroom would be helpful, along with more bath towel racks . We had a very relaxing week at this gorgeous site, and brought home many wonderful memories. Friendly staff, helpful with answers for all my questions. The recommendation for crabs from Gay's Seafood was spot on! Thank you for a wonderful staff. We will be back. Lovely cottage perfect for our stay in Oxford with our dogs. Love the kitchen area and the front living room. Highly recommend the cottage. Walking distance to wherever you go in Oxford. Pool needs some maintenance. Beautiful views and great water access! Bushey Heath Farm is a lovely home and a great late summer escape. It is so peaceful and quiet but with the boat dock, crab traps, pool and large yard there was plenty for our kids to do outdoors! We enjoyed every minute of our vacation! ESVR was very easy to work with. Finding a home to rent was simple, web site was clear and accurate. We had to make one call after hours and that situation was handled just fine. The Pines at Barrett Cove was a beautiful location! Very quiet, and just a 10 min ride to town. House was as pictured on website. The only complaints we have is that the outside of the house and property need maintenance: a good power washing, trees need to be cut back off of house and grill area( perhaps that would help to have less spiders), the windows and doors of home were caked in old and new spider webs and clusters of dead bugs, gardens were weedy, it looked as if outside was a bit neglected. Also, I grew up in a home with well water and never experienced the horrible odor we had- especially in the kitchen and master bath(it really smelled like sewer water) this was very unpleasant!! I would also suggest that the pool maintenance come after the grass cutters because the amount of grass that was blown into the pool was ridiculous and we spent over an hour trying to get it all out ourselves. ESVR makes everything very easy -- helping to find the right rental for us, the ease of check in and out, handling of any issues, etc. Having said all the things in my response to #8, I want to mention the positive features of the property that we liked: the small fenced area to let the dog out without him running all over the big property when we didn't want him to; the canoe and kayaks; the sun on the pool in the afternoon; the view from the kitchen and family room (we stayed in Grace Creek Cottage last year and there are no views of the water from anywhere, really, in that house); the fire pit; the huge yard (great for wiffle ball or buoy ball!). The members of your team were the most professional and efficient. We've rented with VRBO in the past and felt "disconnected" from the rental process. I swore we would never go that route again & rent from a realtor instead. We are very pleased with Eastern Shore Rentals, the whole process, and the staff. There were no surprises; everything was as stated in the contract; and the knowledge that someone was on the other end of the phone should we need anything was comforting! This property was secluded, quiet and full of nature. We enjoyed fishing & crabbing off the dock & in nearby Blackwater; taking photos of the wildlife and beautiful sunsets; and relaxing on the dock with good books! Thank you for the time to rest and relax in Bay Water... the best vacation ever. We would love to return next year! What a beautiful home! Plenty of space for a few families. The kitchen is FULLY equipped, they didnt miss a thing. Beds are very comfortable and the bedrooms are cheerful and spacious. We went with 2 others couples and kids, and our stay as very enjoyable! The pool was great addition and the grounds were perfect for an evening walk. The town of Chestertown is beautiful. Good restaurants if you want to venture out and the farmers market was fantastic. I would highly recommend a visit to this beautiful home! What a wonderful property. The water views from every room are simply amazing! Some of the prettiest sunsets we have ever seen! The house is roomier than expected for a cape cod. Well stocked home and a great time had by all! Previous renters left a cell phone behind. Staff stopped by to pick it up. No problems. Crabber's Cove was lovely and peaceful. The family really enjoyed having access to the bikes and kayaks. A beautiful property. A short ride to town by bike or car. Loved that we could bring the dog along. A wonderful, relaxing experience. Thank you!